I am asking you a favor in this post. Artsetter is a Paris based online art gallery. I like their approach as they take the risk out for the buyer and the seller. When you purchase an art work, Art Setter holds the money through a French bank. Then the artist ships to the buyer. Once the buyer receives the art work, Artsetter release the money to the artist taking what is a very modest commission for the industry. You are allowed to arrange your own gallery. They are also setting up a community as members can vote for and favorite other artists. Anyone can apply to join. I am trying to set up an online gallery for my art on the site. I have applied and now need 50 votes over the next 30 days. Can you vote for me? You have to first register at their site but it is quick and there is nice art by a number of artists. Here is the home page of the site. My five paintings have been cropped by the site to fit a square format. They are actually all rectangles. However, once I set up my gallery I will be able to display the full painting. You can see the complete images of five I submitted below. You can click on any image to make it large. Once you get to the site go to the candidates tab. Be patient it takes a few moments for the first one to appear. I have been coming up first as I was the last one when I last looked but someone may have come in after me. In the case I do not come up first, scroll through the others to find my application. There are quite a few excellent painters and photographers. I voted for a number of them myself. This Is not a competition. You can vote for as many as you want. Thanks for your consideration. Let me know what you think. Goollery is an online gallery of Google-related projects from people around the world. There are a number of categories: Google Brand, Search, Maps, Earth, Image Search Chrome, SketchUp, Translate, Android, and YouTube. Within each category there is a variety of projects. For example, under search I found, a painting project that had the Google search page done in the styles of Miro and van Gogh, as well as several original themes by Valéry Grancher, France. Under maps, there is Ohio Piano. There are 88 counties in Ohio and 88 keys on a keyboard. With Ohio Piano, the state map is turned into a piano that you can play with two pre-programmed melodies. It is by Andy Woodruff, Cambridge, Massachusetts. There is also British Art From the Tate that allows you to explore locations of paintings within the Tate with Street View depicted in a special selection of Tate artworks. You can discover how urban and rural environments have changed, and the views painted by artists such as Turner and Constable are now lost. It is by www.svmapplets.com. In another Google maps project. Artist Bill Guffey from Kentucky painted scenes from around the world that he saw with Google Street View. Word Magazine UK created a project where iconic album cover photographs are mapped via Google Maps. I could go on but you get the idea. It contains some very creative work. I have written about Liz Sweibels’ art in past posts (most recently see Many Kinds of Nothing Creates a Nice Art Space and Liz Sweibel’s New Art Web Site and Blog). Now she has extended the exploration of small spaces displayed in the Many Kinds of Nothing exhibit with a series on videos on her web site. You can find them on her Liz Sweibel web site under the little videos. I especially like the ones that shown movement within her small constructions. They fit the small video format and cause you to look more closely at the small things in life. I often see art works embedded in the visual experiences I encounter during the day. These small videos will prompt more of these experiences. I came away thinking about the visual world in an enriched way, which is the objective of most art. Here is a great idea. It is the ultimate recycle. The Pollocks art collective recently opened a temporary shop named Worthless. It plays with notions of consumerism and the perceived value of material objects. Participants brought in random objects to the London store that they considered junk, everything from old hard drives to tattered shoes. The Worthless team then transformed all the cast-off goods into unique pieces of art. Customers were then able to buy back their submitted items for whatever the felt they were worth. You can see a video about the project at the PSFK post on the effort. This idea might catch on. Instead of throwing stuff out, have an artist make into an art work. Many great art works have started from junk. Why not have this done for you? Send me an email with a picture of your junk and I can give you an idea of what I might do. Nicko Margolies over at Marktd brings us the time lapse photography of Robert Burden creating “Defensor Mundi” (Defender of the Earth in Latin) on YouTube as he depicts a triumphant Voltron, standing 11 by 7 feet tall. Burden spent a year working on it. If you like this painting go to Robert Burden's Toy Box for more. Enjoy. Here is a really creative art idea. Canadian artist Melanie Coles has painted a 55ft Wally on top of a building that can be seen by Google Earth satellites and put up a contest on her website to find it. You cannot see it from the ground. There is a great description of the project on her site, whereonearthiswaldo. Thanks to the IF team for bringing this to my attention. 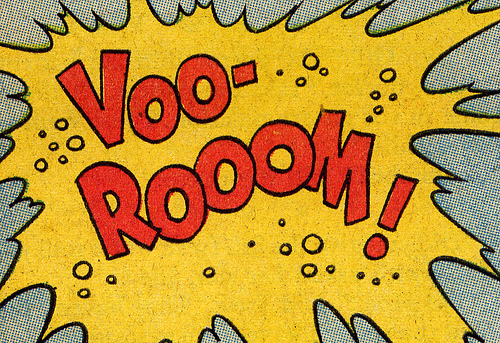 Thanks to the IF team for this great link to Comic Book Sounds on Flickr. Enjoy.